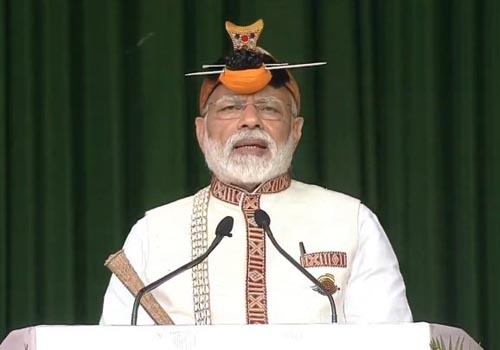 Prime Minister Naredra Modi addressing a public rally in Itanagar. Amidst protests against Citizenship (Amendment) Bill , Prime Minister Narendra Modiarrived at Itanagar in Arunachal Pradesh on Saturday. Prime Minister Modi was greeted in with black flags by several civil society groups. Modi, who is leading the Bharatiya Janata Party‘s campaign blitzkrieg ahead of this year’s Lok Sabha election, is on a whirlwind tour of Assam, Arunachal Pradesh and Tripura on Saturday. “Arunachal Pradesh is India’s pride…it is India’s gateway, and I assure you all that we will not just ensure its safety and security, but also put in on a fast-track to development,” PM Modi said. He said tourism sector has a huge potential in a state like Arunachal Pradesh. “With its beauty it can mesmerize people who visit here. There is potential for new employment avenues for the state’s youths,” Modi added. “Airports, railway lines and more trains, highways and roads and electricity are just a few examples of development in the Northeast. I am glad that Arunachal Pradesh is progressing at a fast pace. I thank the chief minister and his entire team for this,” he added. “We are emphasizing on power generation. Today 12 hydro electric projects of 110 MW were inaugurated which will not only help Arunachal Pradesh but also adjoining states,” said Modi. The Prime Minister said government allocatedRs.44,000 crore fund to Arunachal Pradesh which is double the amount provided by the previous govt. “In the last two years, around 1000 villages have been connected through roads. The work of Trans Arunachal highway is also under progress,” said the PM. The Prime Minister inaugurated and laid the foundation stones/plaques of nine projects in the state. The prime minister began his visit to the northeast by laying the foundation of the Greenfield Airport at Hollongi in Parum Pare district of Arunachal Pradesh shortly after 10 am. PM Modi also launched work for a strategic tunnel in Sela, which will reduce travel time to the India-China border town of Tawang by over an hour. Modi inaugurated DD Arun Prabha Channel, upgraded Tezu airport, 110 MW Pare hydroelectric project, 50 health & wellness centres in Itanagar. The airport will not only boost the region’s connectivity and economic growth, but will also be of strategic importance. Prime Minister Modi then proceed to Guwahati in Assam, where he is scheduled to reach around 12:30 pm. His last stop for the day will be in Tripura, where he is scheduled to arrive at around 3:30 pm.